As maritime trade in Maine’s Penobscot Bay flourished in the 1800’s the Light House Board sought to light the busy harbors of this waterway. The port of Carvers Harbor on Vinalhaven, with the growth of the granite quarrying industry along with an established lobstering fleet, needed navigation aids to assist shipping. The Board decided to establish a lighthouse station 2 miles southwest of the harbor on Green’s Island on a rocky outcropping known as Heron Neck. 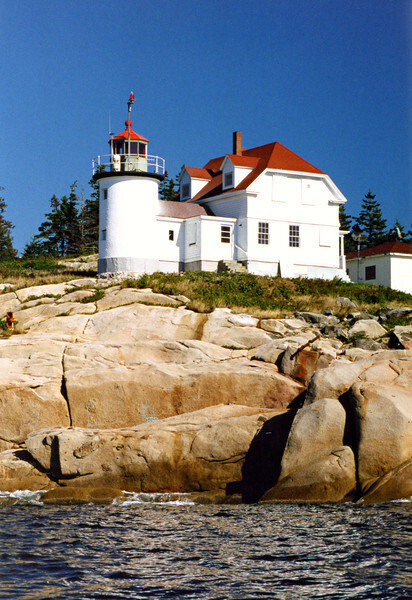 In August 1852 Congress responded to the Light House Board’s request by appropriating $5,000 for the construction of the light station. In 1853 work began on building a 30 foot tall brick cylindrical tower attached to a 1½ story brick Keepers dwelling.